Winner of Best Saltwater Reel at ICAST 2010! 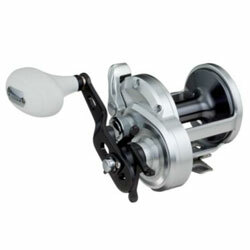 All things considered, Shimano's Trinidad reel is one of the best star-drag models available today. Features High Efficiency Gearing (HEG), X-Ship gear support system, Dartainium II woven carbon fiber drag, ultra-lightweight aluminum Magnumlite spool with E.I. corrosion protection, compact one-piece aluminum frame, Super Stopper with Silent Twin Pawl Assist Stopper, manual metal clutch lever with Corrosion Prevention Pad, and drag star with Micro-Click. Eight ball bearings plus 1 roller bearing. "I am very satisfied with this reel. I love the one hand lever operation. I have Haven't found anything it wont handle, snapper, grouper, aj's etc. My fishing partners have used it once and have already placed an order for theirs. Cant go wrong here. I might would choose the wide reel instead of the narrow if I had it to do over again. Still an awsome reel. Way to go Shimano, great product."